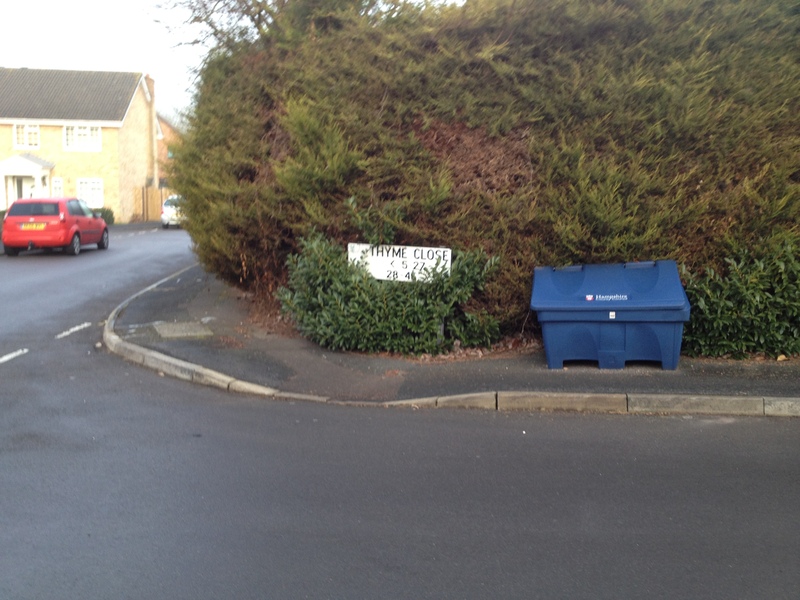 Just spotted this grit-bin plonked down across a pavement by Hampshire County Council. Shame that they couldn’t find anywhere for it which wasn’t blocking the pavement for buggy and wheel-chair users, especially as they had been to the effort to create a dropped kerb. The hedge could do with a trim as well. 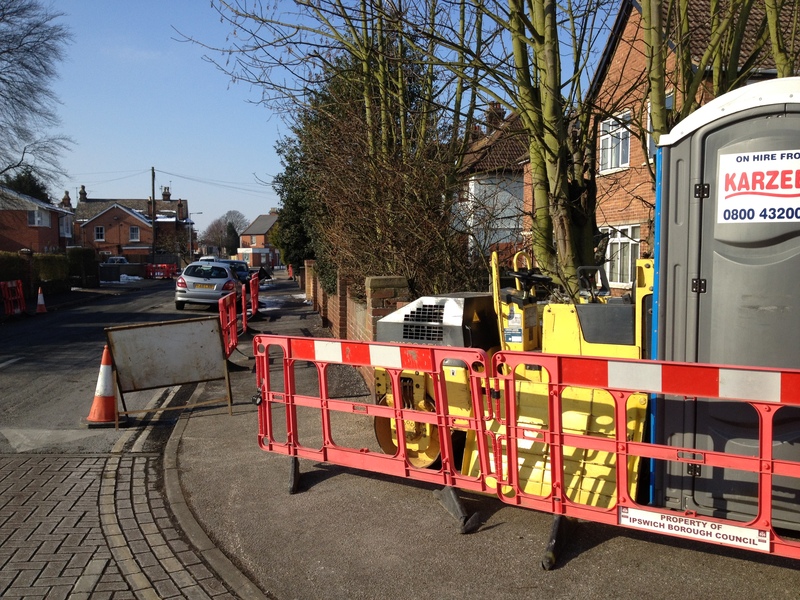 Back in Ipswich, I spotted Ipswich Borough Council doing more repairs to the local pavements which is good, however I can’t help thinking that they could have organised the barrier around their roller and portable toilet a bit better. To their credit they did adjust it to reduce the problem after I had taken the picture, but why wait for someone to point it out? They continue to leave signs illegally obstructing the pavements, but that isn’t news any more so I will leave the pictures this time. Talking about toilets, I recently also spotted this portable-toilet/van which now regularly left parked half-way across the pavement in a nearby residential area. Do these companies check where their staff are going to park them before suggesting that they take them home? ← Customers – please stay at home! 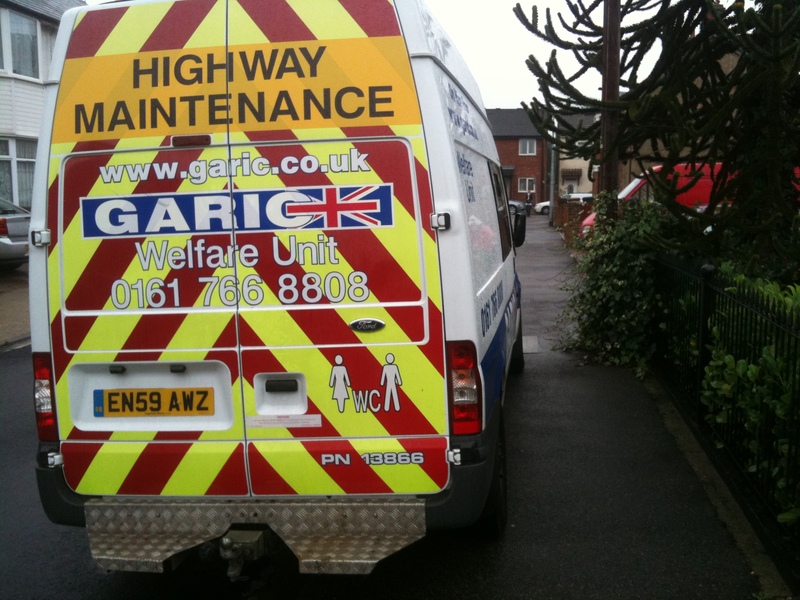 Garrick have a habit of parking their vehicles on the pavement. I have complained to them but didn’t even receive an acknowledgement of my complaint. I have a great photo of this, but can’t work out how to attach it. I’ll try to post it on the rogues gallery. You can always post it to Flickr and add it to the ‘Pedestrian Liberation’ group and it will then appear on the main page. Hope the pedestrian’s shoulder is OK after ‘adjusting’ that wing mirror!